Oh boy do I have a treat for you!! I have the first salad of the year that is Husband approved! Yup! It’s just that good!!! As you know my Husband is not a fan of salads and when I went to make today’s salad he mumbled salad with apples, what? I said trust me on this one. He wasn’t thrilled and then he ate it and at the end he was actually smiling, practically licking his plate clean and said this is really good! Woohoo!!! But the question I always ask is “would you eat this again?” He said YEAH!!! I was actually shocked on how much he enjoyed this salad. Honestly out of all my salads I have made, I was kind of surprised how much he liked this one. But really how can you not? 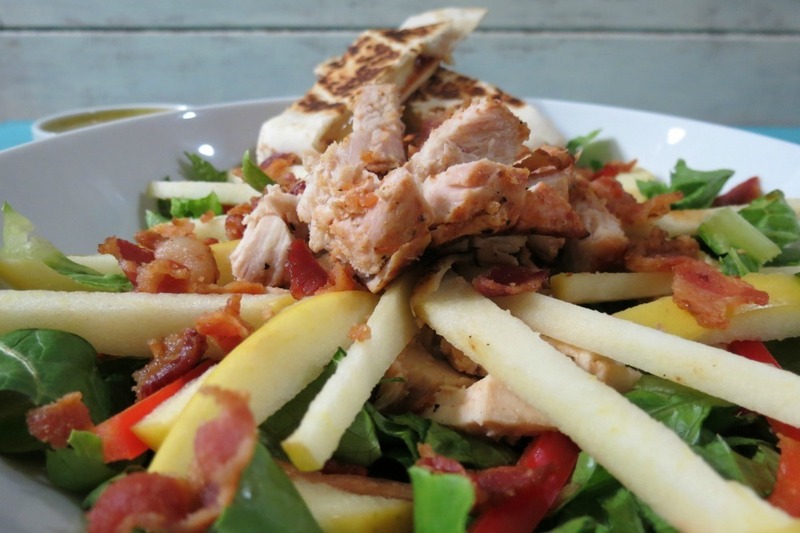 It’s made with BBQ chicken, bacon crumbles and the star of the show Opal Apples. Oh yah!!! The salad is sweet, savory, fresh and just simply perfect in my eyes. I made a semi-sweet salad dressing that contains apple cider vinegar, white vinegar, garlic, dijon mustard, olive oil and a pinch of stevia. The dressing was a nice match without over taking the taste of the salad. Since I normally like to serve bread with my salads, at the very last-minute I decided to whip together a quesadilla instead. Great idea!! 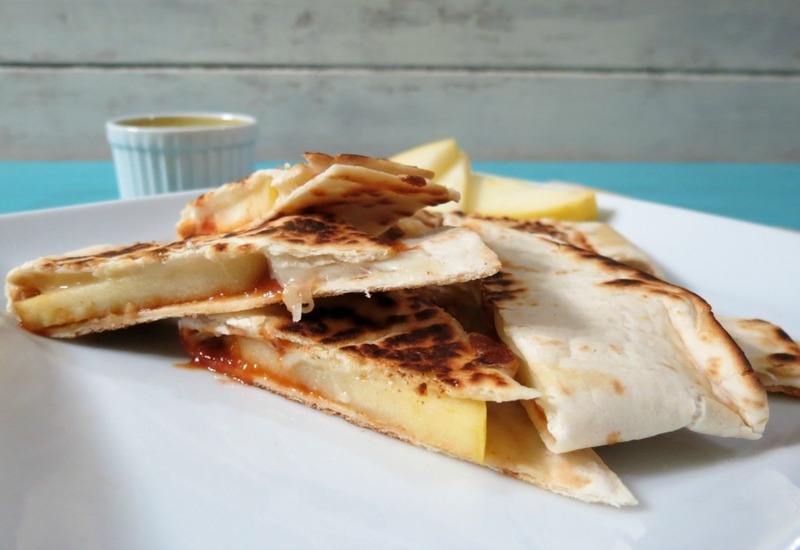 The quesadilla is made with BBQ Sauce, Opal Apple slices and mozzarella cheese. I sliced it into strips and served it with the salad. The combination of the sweet, yet tangy Opal Apple and BBQ sauce really goes well together. My Husband even ate the quesadilla. I made one, but I probably should have made two. Next time I will and believe me there will be a next time. I decided to make an apple salad because I received a wonderful shipment of Opal Apples. Have you ever had an Opal Apple? They are amazing!! They remind me of a combination of a golden delicious and a granny smith apple, but way BETTER!!! Fun fact: They are actually a cross between a topaz and a golden delicious! I knew I was close! 🙂 The texture kind of reminds me of a pear, but crunchy and they are just in the most beautiful yellow color. Oh and get this, they don’t brown when you cut them! So it makes them perfect for salads, snacks, lunches and more. I never had an apple not brown while eating it. Check out my Instagram picture of my Opal Apple with peanut butter. As you can see from the picture, no browning! Opal Apples are available only December through April. They are grown by only one grower in Washington State so supply’s are limited, but are available at select grocery stores nationwide including Costco. So be sure to pick some up while you can. Believe me, you will love them. They are my new favorite apple!! 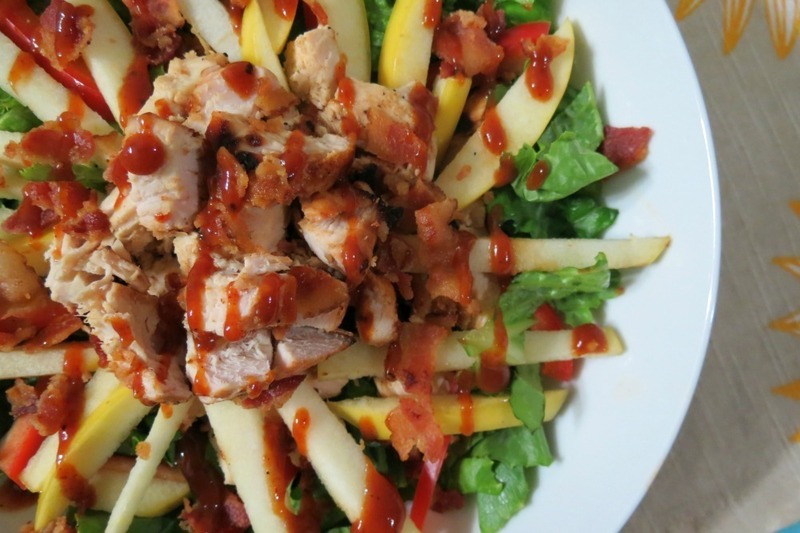 When I made this salad, at the very end I decided to add a pinch more BBQ sauce to it, since I kind of have a thing for BBQ sauce, which really mixed will with the salad dressing. My Husband is a fan of ranch dressing and he added that to his salad. He’s not the biggest fan of a balsamic dressing. Me, I could drink balsamic dressing if I could, I wouldn’t, but I could. 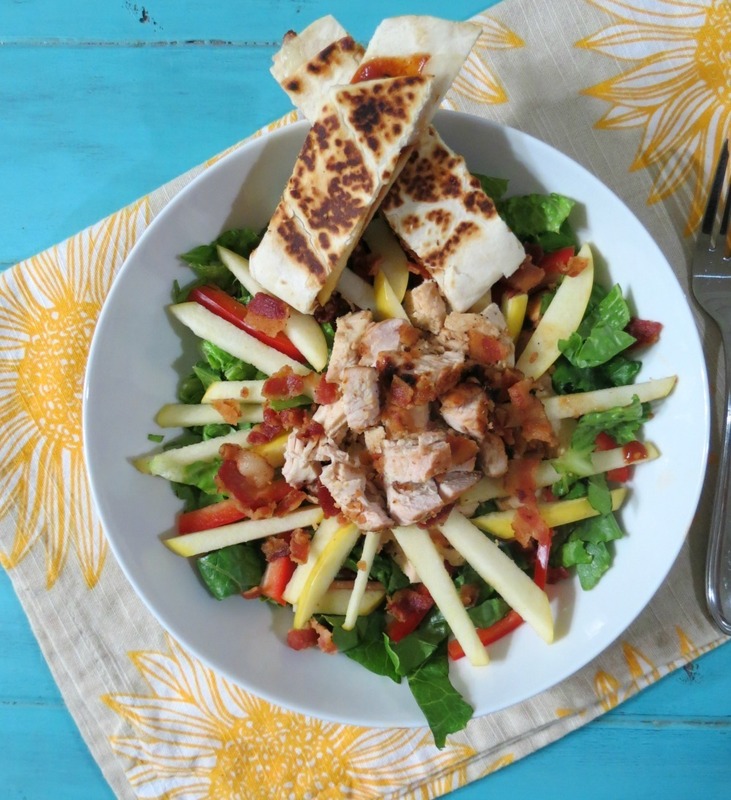 A slightly sweet and savory salad made with BBQ chicken, Opal Apple slices, bacon and served with a cheesy BBQ and apple quesadilla. Heat the grill to medium and place chicken on grill. Brush one side of chicken with half of the BBQ Sauce. Cook for about 8 minutes, flip chicken and add remaining BBQ Sauce, cook for about 5 minutes longer or until chicken is no longer pink. Let the chicken cool, and dice up into tiny pieces. While chicken is cooking in a small bowl, add apple cider vinegar, white vinegar, dijon mustard, minced garlic, olive oil and stevia. Whisk until combined; set aside. Meanwhile, Divide between two plates; romaine lettuce, julienne sliced Opal Apple, and bell pepper. Divide the chicken between both plates and top the chicken with bacon crumbles. To make Quesadilla: Spray a small skillet with cooking spray and place over medium heat. On half of the flour tortilla, add BBQ sauce, apple slices and cheese. Fold in half. Place on the warmed skillet and cook until lightly brown and flip and cook until lightly brown and cheese is melted. About 5 minutes total. Slice quesadilla in 5 slices. Add dressing over salad and serve with quesadilla. I also added a pinch more BBQ sauce over the salad for an extra pop of flavor. The calories maybe less, I had quite a bit of salad dressing left, which is where all the fat in the nutritional stats come from. But it's a healthy fat from the olive oil. I am just so excited about today’s recipe. Not only did I get to eat the most delicious apples ever, but I also got to get outside and BBQ. I haven’t done that in months. Oh how I miss the summer. One thing I forgot to tell you about Opal Apples that they are non-GMO and available organic or conventional. Plus they are an apple with a cause!! They seek to build holistic, sustainable community by empowering members to put their dreams into action and then serve those most in need within their community. To that end they are sponsoring the Opal® Apple Youth Make a Difference initiative for 2014, and are looking to our fans and the general public to help us find their next great cause. I think that is fabulous and makes the Opal Apple even sweeter! You can check out Opal Apples charity page here, and if you have a suggestion, let them know! You can also find Opal Apple on Facebook! Now don’t forget you can find Opal Apples at Costco and other stores nationwide, so be sure to pick one up and give it a try! Use it for your next winter-time BBQ. 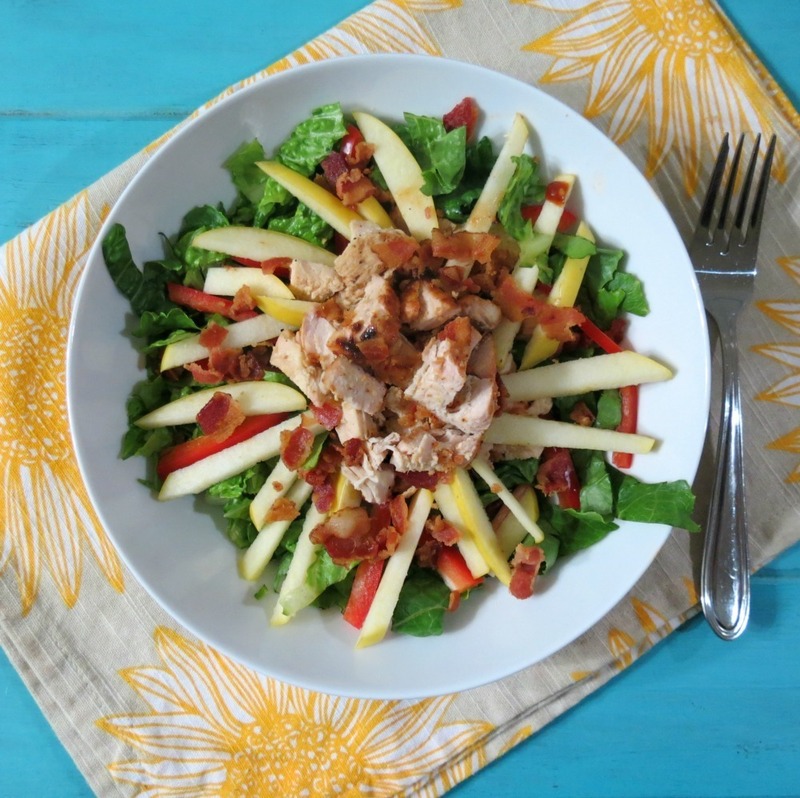 You can check out other fun Opal Apple recipes at Kitchen PLAY! 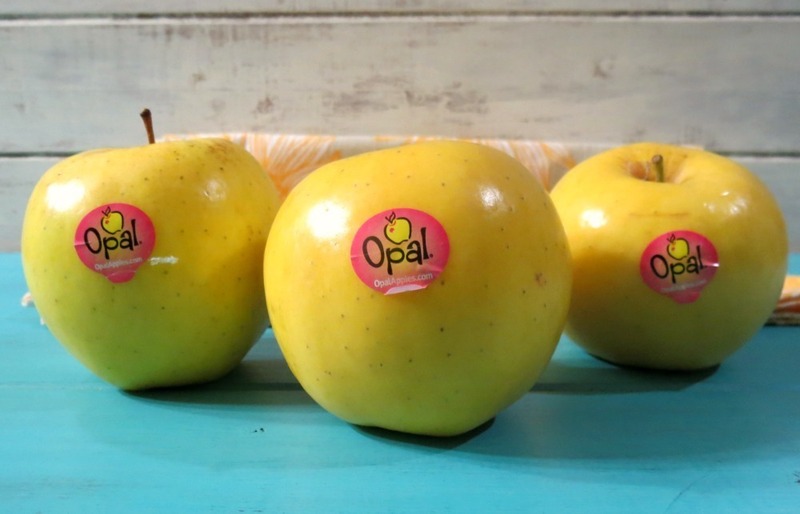 Ready to try Opal Apples for yourself? Join us for an #OpalApples Twitter Party where you could win one of five prize packs, including a shipment of these tasty apples. For more information, guidelines, and to register for a chance to win, visit http://kitchen-play.com/opalapples . Then join in on January 21, 2014 at 9:00 PM ET (6:00 PM PT), using hashtag #OpalApples. Here’s a clue to help you win: Opal Apples are bright yellow. P.S. The day after I made this salad, my Husband and I had a party to go too. They told us to just bring what we will drink. My Husband said instead of bringing drinks/boos, make the Apple Salad and bring that. Double shocker! I guess he really did enjoy the salad and I think everyone else did too!! This post has been sponsored by Opal Apples and Kitchen PLAY. All opinions are my own. This sounds so good. I have never heard of Opal apples and can’t wait to try them. Hope we can find them here in Florida. Thanks for introducing them to us. I hope my husband likes it too!!! Hi Maria! You will love Opal Apples! They are just so perfect!! I bet you will be able to find them in Florida, they are available nationwide, but only till April. Oh and I am sure your Husband will like them too! What kinda BBQ sauce you use? Sounds and looks delish, I especially LOVE the quesadilla! Hi Sophia! I used Stubbs Spicy BBQ Sauce! The quesadillas are so good! Funny how apple, cheese and BBQ sauce go so well together! Even my picky Husband liked them!! My husband is the same way, I am sure he would LOVE this salad!! 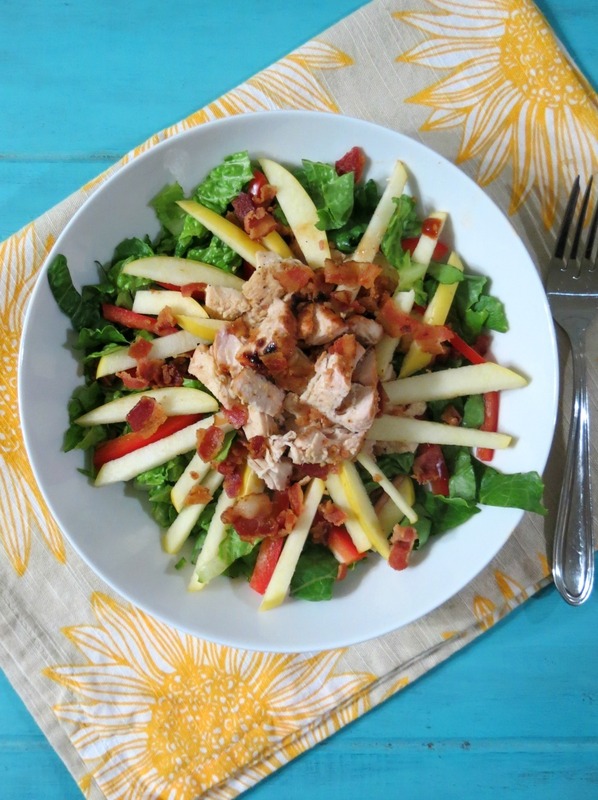 I love apples in my salad. But yours with the chicken, BBQ sauce, and bacon–it sounds absolutely wonderful! I haven’t seen Opal apples in the stores here, but I’m really intrigued. Opal Apples are available until April. They are at Costco and some local grocers. I hope you will be able to find them. They are truly, very good!